Briefly: Told in the format of an admissions letter to a university, our correspondent is a very smart girl of small means – at least compared to her fellow students at Mark Frost Academy. A Latina scholarship student, Perry Gonzales is often called on to help tutor other teens at her school. Sometimes, though, it is more like babysitting. Babysitting very rich children who should know better. This is subtitled “A Cautionary Tale,” and there are seven stories within. Enjoy Perry’s wry observations and wild tales as she works her way through the list of the Seven Deadly Sins, seeing them in her fellow classmates. Her mother, a wise woman, is a nurse who keeps Perry grounded in the real world…or so you’d think. But just as you’re about to close the book, the tenor of it changes abruptly. That’s all I’ll say, except that it did make me feel a little foolish, a bit cheated and sort of weird. To Read or Not To Read: It’s an enjoyable read that will make you laugh more than caring about the characters, but there’s that shift in the storytelling that I am going to have to think about for a while. Seven Deadlies: A Cautionary Tale by Gigi Levangie was published today by Blue Rider Press. A free copy of this book was given to Ink and Page in return for an honest review. Big thanks to Blue Rider Press/Penguin USA and Ms. Levangie. Now for the giveaway! 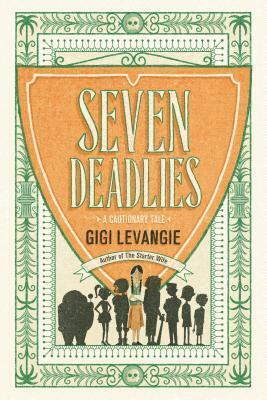 Enter for a chance to win a SIGNED copy of Seven Deadlies: A Cationary Tale by Gigi Levangie below. The contest will last one week, and the book will be sent directly from the publisher.